Located at the mouth of Middle River, less than a mile from the Chesapeake Bay in Maryland, Bowleys Marina is very susceptible in the spring and fall months to westerly winds that raise waves in the marina basin. In an effort to reduce the impact of those winds and boat wakes, the marina is installing two wave attenuators in the fall of 2018. 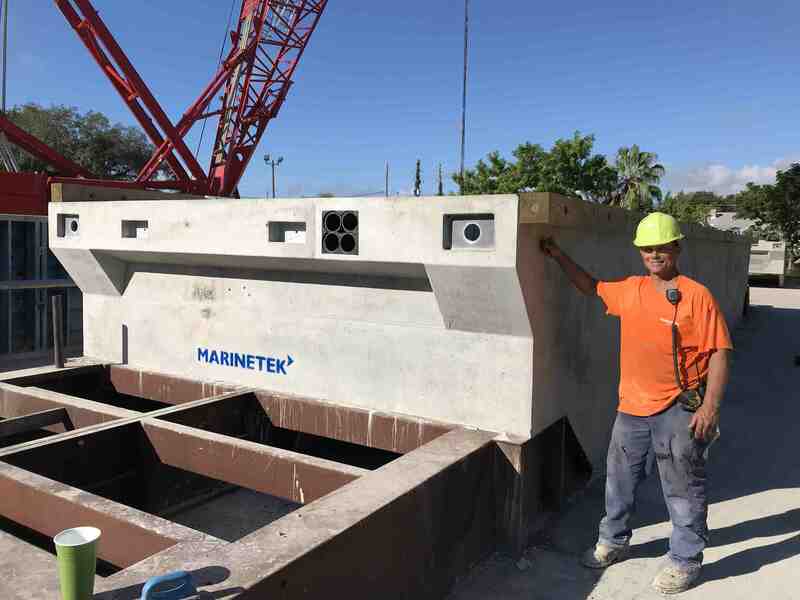 At the south-west corner of the marina, where the fetch is longer, the marina chose Marinetek to provide a floating concrete breakwater that is designed for waves up to five feet high. “The system is 14 feet wide by 6 feet tall with twin keels,” said Bob Berry, project development manager, Marinetek North America. It includes 40-foot dock sections and 50-foot dock sections that weigh approximately 43 tons. The docks are anchored with 24-inch-diameter steel pipe piles, internal to the docks with stainless steel pipe guides. This wave attenuator replaces a failed, fixed timber-wave fence that had vinyl sheet pile walls. Marine Technologies Inc. of Baltimore demolished and removed this old dock before installing the new Marinetek system. Whitney Bailey Cox & Magnani are the engineers for the project. On its south side, the marina is reconfiguring its entire fuel pier. “We’ve shortened a couple of piers and have installed a new 488-foot fuel dock. That is more of a hybrid system with timber truss construction and some concrete wave attenuation panels suspended beneath it,” said Ed Harwood, marina manager. Meeco Sullivan is building this attenuator/fuel dock. While the new fuel dock will not have slips right away, they could be added if the demand is there, Harwood said.